Based in Lancashire, we work with clients across the UK and Europe – from small independent retailers to major brand names. To us, size doesn’t matter: we apply the same rigorous levels of care, craftsmanship and professional service to each and every customer, whether they are a small local bar or a national retail chain. 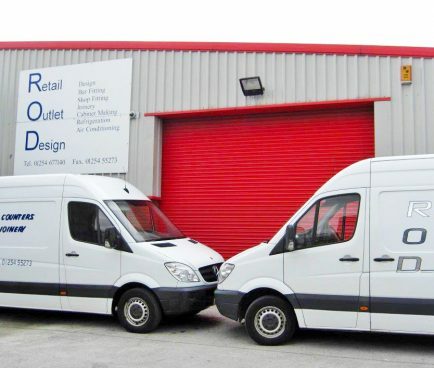 Here at Retail Outlet Design we are proud of all our staff who are a highly committed team who take genuine pride in their work, and go that extra mile for our customers. Our factory in Blackburn houses state-of-the-art manufacturing facilities, where ideas are brought to life and visions turned into commercial reality. We are registered Hi Macs and Corian Fabricators, enabling us to build and install counters for the high-end of the market, meeting the demand of the rapidly expanding convenience sector. From quality high volume components to bespoke joinery products, our creativity, skill and attention to detail will ensure a superior solution – every time.